Japanese Episode AG 004: "Subame ga Ippai Kiken ga Ippai! Touka no Mori de Getto da ze!!" American Episode 276: "You Never Can Taillow"
Now joined by Haruka's little brother Masato, Satoshi-tachi venture into the Forest of Touka en route to the next gym. When a Subame swoops in and takes the hungry group's last piece of food, the group chases it to an area with a bunch of apple trees. Just as it seems that the group's food situation is resolved, a huge flock of Subame appear and confront the trio! Despite Pikachu's best efforts, the flock of swallow pokemon won't back down and begin to overtake Satoshi-tachi. All seems lost when Takeshi, Satoshi's traveling companion through the Kanto and Jouto regions, appears with his Forretress! 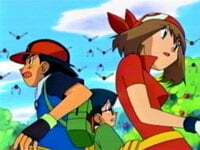 After its Big Explosion technique takes care of the pokemon, Forretress' trainer is introduced to Haruka and Masato. Meanwhile, the Rocket-Dan find the flock of Subame and use some onigiri they had stolen earlier to persuade them to help them out. 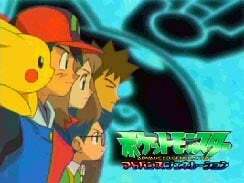 Back at the camp, Takeshi is cooking the group a meal when the Subame who had stolen the group's food earlier challenges Satoshi to a battle. After a long battle, Pikachu is able to weaken Subame enough to enable Satoshi to capture it. Satoshi has captured his first Houen pokemon! Just then, the Rocket-Dan appear with the flock of Subame, and they seem to have the upper hand until the flock notices all the food Takeshi's made. They quickly befriend Satoshi-tachi, so since the Rocket-Dan doesn't have the flock to rely on, they are quickly defeated. Satoshi-tachi finish their stew as they welcome Takeshi to the party. I have to wonder about 4Kids' tendency to widdle away a second or two from each episode lately. For an episode like "Hoenn Alone," I can understand the need to cut a second here and there, but for a regular ol' episode like this I just don't see the point. I realize that they never cut away any important footage, but it's still annoying that they feel the need to trim the episodes the way they do. Wouldn't you think it would be less work just to leave the whole thing alone? Anyway, this was a very busy episode. 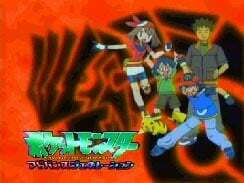 Takeshi returns, Satoshi catches his first Houen pokemon, and Kasumi sorta kinda makes an appearance (see below). Taillow's dubbed voice didn't bother me as much as it seemed to bother other people, but May still gets on my nerves. Ms. Taylor could at least try to make her two characters sound different, but I guess where she's from ten year old girls and young teenage boys sound exactly the same. They originally just called it "chocolate," but 4Kids decided to call them cookies for the dub. They don't really look like cookies at all, but whatever. Also, with the return of Takeshi, we get the return of the "Name that Onigiri!" game! Jessie: "We come bearing gifts!" Y'know, I've actually begun to look forward to the interesting names 4Kids gives to onigiri. I'm beginning to get the impression that they'll never run out of things to call these little balls of rice, much like the way they'll never run out of bad puns to use for their episode titles. Isn't anyone else excited to see what they'll be called next time? So now the group's all there. This version of the eyecatch will be phased out about two thirds of the way through the Houen League. When Satoshi throws the Monster Ball, the two shots of the Monster Ball wiggling about are shortened by a second each. Anyone else notice that Satoshi used the hankerchief Kasumi gave him in "Gotta Catch Ya Later" to wipe the chocolate off Subame's mouth? Nice bit of continuity there, anime people. And finally, after the last commercial break on Kids' WB!, a second from the shot of Takeshi's empty stew pot is cut. Because we all know how controversial an empty stew pot is.